Download WBGDRB Group D Previous Papers here that are available. 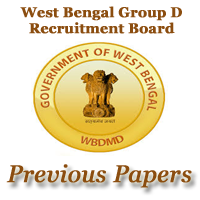 Therefore, the applicants who are applied for the WBGDRB Group D Posts can get Past 5 Years Question Papers PDF Files of West Bengal Group D Exam. Also, find the West Bengal Group D Exam Study Material. In additional to the Exam Materials of WB Gr D Exam, preparation tips are also available on this page. Go through the entire article to get WB Group D Exam Solved Papers Free Pdf. People can also refer the West Bengal Group D Recruitment Board for more further information, i.e., www.wbgdrb.in. Also, check the Previous Papers to get papers. If you are preparing for the West Bengal Gr D Exam 2017. Then do not worry. We advise that the aspirants, check the Old Question Papers of WB Gr D Exam to identify the variety of questions. In this article, candidates will get precious materials concerning WBGDRB Group D Model Question Papers. Hence the aspirants can get the West Bengal Group D Sample Question Papers at free of cost. A number of people are battling for the WB Gr D Examination 2017. Hence the applicants have to more active enough to face this competition. And also get your dream job. Therefore, Download WBGDRB Group D Previous Papers are here. And make worth of these papers in your preparation. You can also find the syllabus and exam pattern. In addition to the West Bengal Group D Previous Question Papers, we are providing the exam pattern. The West Bengal Gr D comprises of Objective type questions. This WB Group D exam is for the 100 marks including the interview. The questions of the WBGDRD Exam are from the General Studies, Language Papers and Mathematics. The written exam is for 85 Marks. And the interview is for the 15 Marks. Totally the Group D Exam of West Bengal is for 100 Marks. West Bengal Group D Recruitment Board has recently issued the notification for 6000 vacancies of State Government under various posts. For the people who are waiting for WB Govt Jobs, it is good news. All such candidates can check the WBGDRB Group D Recruitment 2017. And they can apply before the last date. West Bengal Gr D hiring process includes the written test followed by the Interview round. Hence all the candidates have to begin the preparation from now onwards to qualify the Exam simply. To make your exam preparation simple and effective, here we are giving WB Group D Exam Pattern and Syllabus. Hence get the complete info according to West Bengal Gr D Exam 2017 from the later sections. The applicants who want to try the WB Group D Exam are in browse for WB Group D Recruitment Board Pattern. For the sake of such candidates, we are providing the West Bengal Gr D Pattern 2017 along with papers pdf. Also, refer the exam pattern to know the Group D Exam Question Paper pattern and exam duration and marks for each subject. All such aspects of WB Group D Paper Pattern are available in the above table. Therefore, you can see the above table for WBGDRB Group D Exam Pattern 2017. You can have a glimpse at this great collection of West Bengal Group D Previous Year Papers. Getting a govt job is not a simple thing nowadays. For that, participants have to work hard and sharp enough to qualify the WB Group D Exam simply. Hence, to make your preparation simple, you have to practice the WBGDRB Group D Exam Model Papers. The applied candidates who want to download. They can download them just click on the following links to find the WBGDRB Group D Previous Papers PDF along with the answers.